Starring Amanda Seyfried, Lily James, Christine Baranski, Julie Walters, Pierce Brosnan, Colin Firth, Stellan Skarsgård, Dominic Cooper, Cher, Andy Garcia, Alexa Davies, Jessica Keenan Wynn, Josh Dylan, Jeremy Irvine, Hugh Skinner, Celia Imrie, Omid Djalili, Gerard Monaco, Anna Antoniades, Panos Mouzourakis, Maria Vacratsis, Naoko Mori, Togo Igawa, Anastasia Hille, Susanne Barklund, Jonathan Goldsmith and Meryl Streep. Distributed by Universal Pictures. 114 minutes. Rated PG-13. When I first started seeing the trailers for the second Mamma Mia movie, scored by the classic song “Dancing Queen,” I must admit I was a little puzzled. 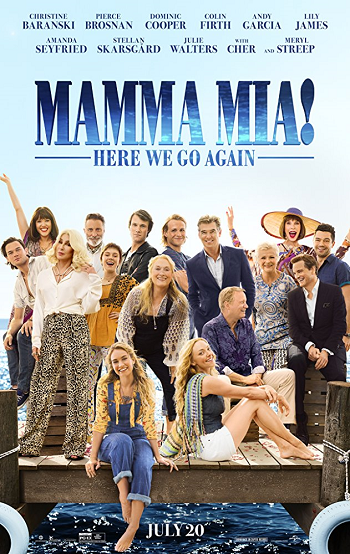 See, the first Mamma Mia movie, which was very loosely based on the hit stage musical – arguably the first of the “jukebox” musicals to become a true smash – took all its music from songbook of 1970s international superstars ABBA. However, almost all of ABBA’s biggest hits – including “Dancing Queen” – were used in the first Mamma Mia. Were they going to make a second musical film where they just sing the same songs over again? Or were they going to take a deeper dive into the ABBA songbook – which is pretty massive and full of wonderful music, granted – and make a musical out of lesser-known ABBA tunes and hope that the audience will flock in to see a bunch of songs they may not know? Turns out that Mamma Mia: Here We Go Again compromised and staked out the middle ground. They do new versions of several of the bigger hits or more well-known tracks that also appeared in the first film. But, they also did mine deeper into the ABBA catalogue and pull out some unused gems, including my favorite ABBA song ever, “Angeleyes,” as well as other slightly overlooked minor hits and album tracks like “When I Kissed the Teacher,” “Andante, Andante,” “I Wonder” and “I’ve Been Waiting for You.” It’s a nice mix, enough of the obvious hits to get the casual fans on board and a fine sampling of lesser-known tracks, most of which are deserving of the exposure. However, really, is there any reason for a second Mamma Mia movie; particularly since the star of the first film, Meryl Streep, despite being front and center in the promotion of the new film, only has a cameo role in the second movie? Turns out that, yeah, there kind of is. Even though like the first film, Mamma Mia 2 is kind of cheesy and often a little stupid, it’s still a lot of fun… also like the original. I won’t explain why Meryl’s character isn’t there most of the film – that would be kind of a spoiler, even though it is revealed rather early on – but her character of Donna pretty much suffuses the entire story. Actually, Mamma Mia: Here We Go Again basically intertwines two separate-but-connected plots. In the present day – ten years after the action of the first film – Donna’s beloved daughter Sophie is reopening her mother’s gorgeous Greek hotel and invites her three “fathers” from the first film, friends and pretty much everyone to the grand re-opening. Pretty much everyone but her singing star grandma (Cher), who has a history of not showing up when she is needed. There a parallel track of flashbacks in the movie, introducing us to Donna as a recent university graduate – played as a young woman by Lily James. In these scenes, we see the genesis of her friendship, her music career, the young men who became her long-lost lovers in the original film, and most importantly her discovery of a passion for her new home in Greece. James does an amazing job of bringing young Donna to life – giving her a lust for life and a sweet passion for everything going on around her. She is a force of nature and makes the past scenes enjoyable just on the strength of her personality. And, unlike so many actors in the original film, she can really sing. In the present, Amanda Seyfried’s Sophie has changed from bright-eyed young innocent to a strong, upstanding woman – much like her mother. Seyfried is mostly able to carry the film (together with James, of course). The others from the original film are obviously having a hoot – Christine Baranski, Julie Walters, Pierce Brosnan, Colin Firth and Stellan Skarsgård are old friends who are in on the joke and having a little party. And as befits a diva, Cher shows up late, but in style, and she takes control. By the time Meryl Streep shows up for her bit, you’re all in. Mamma Mia: Here We Go Again is a sweet and fun musical, and sometimes surprisingly bittersweet. Like the original, it is inessential, but if you enjoyed the first film you will lap this one up. In fact, in many ways the second go-around is even better than the first. Tags: ABBA, Alexa Davies, Amanda Seyfried, Anastasia Hille, Andante Andante, Andy Garcia, Angeleyes, Anna Antoniades, Celia Imrie, Cher, Christine Baranski, colin firth, Dancing Queen, Dominic Cooper, Fernando, Gerard Monaco, greece, Here We Go Again, Hugh Skinner, I Wonder, I’ve Been Waiting for You, jay s jacobs, Jeremy Irvine, Jessica Keenan Wynn, Jonathan Goldsmith, Josh Dylan, Julie Walters, Lily James, mamma mia, Mamma Mia: Here We Go Again, Maria Vacratsis, meryl streep, movie review, Naoko Mori, Ol Parker, Omid Djalili, Panos Mouzourakis, Pierce Brosnan, PopEntertainment.com, Stellan Skarsgård, Super Trouper, Susanne Barklund, Togo Igawa, When I Kissed the Teacher. Bookmark the permalink.